“The central bank administers the country's pension fund, which is financed mainly by Norway's booming oil and natural gas industries. As the world's third-largest oil exporter, the fund has a king's ransom at its disposal. The last time the the books were balanced, the fund disposed of €196 billion ($250 billion) in assets. Analysts predict it will grow this year to become the second-largest pension fund in the world. Roughly four percent of the fund's financial resources have gone into the state budget every year since 2001. The money is used to cover shortages and finance projects that benefit the well-being of country's citizens. Most of the remaining sums are invested for future generations -- for the time when Norway's oil and natural gas reserves will have been used up. The fund is responsible for no less than 0.3 percent of all the stocks traded worldwide, it holds shares in more than 3,200 corporations and its portfolio reads like a "Who's Who" guide to the world of international investment. It includes Blue Chip corporations such as Accor, Adidas, BASF, Porsche, Siemens, Volvo and Zürich Financial. Norway has shown great acumen with its portfolio -- in 2005, it had a return on investment of 11.1 percent, or about €20 billion ($26 billion)…. In November 2004, the government established ethical guidelines for the investment policy of its pension fund. Since then, an Ethical Council has overseen the various investments and separated the good from the bad. Seven corporations -- among them BAE Systems, Boeing and Honeywell -- were recently removed from the portfolio. Norwegian stocks worth 3.3 million Norwegian krona or €420 million ($535 million) have been sold as part of the ethical clean-up effort. The corporations were blacklisted because of their involvement in arms production -- for producing components that go into the production of nuclear weapons that clash with the "fundamental humanitarian principles" of the Norwegian codex. Overall, 17 arms corporations have been declared off limits by Norway's ethics guardians. In order to avoid similar investments in the future, Norges Bank has armed itself with a strong condex and team of ethicists. "We want to combine economic and ethical interests," investment director Knut Kjaer says. "We are powerful and we can invest in ethical values." Continue reading The Norwegian Model. “So, what you basically see in these countries is when oil is $20 a barrel, Iran is calling for a “dialogue of civilizations” under President Khatami. Magazines and journals are opening Iran. Iran is opening itself up to trade and interaction with the world. Reformers are getting elected. When oil is $70 a barrel, the president of Iran is calling for the destruction of Israel. When oil is $20 a barrel, the President of Venezuela is a little pussycat. When oil is $70 a barrel, he’s telling George Bush and Tony Blair – just about everybody else – to go to hell. When oil was $20-$30, George Bush looked in Vladimir Putin’s soul and saw a good man. When oil is $70 a barrel, you look in Vladimir Putin’s soul and you’ll see Gazprom, you’ll see a bunch of other newspapers and independent institutions that the Russian president has swallowed. So it seemed just intuitively right to me that there was an inverse relationship between the price of oil and the pace of freedom. And so with Moisés help and his team, what we did was actually create a graph with the price of oil on one axis and we used the Freedom House graphs of their freedom index and just overlaid it. 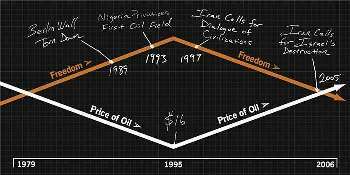 And what you basically see is this relationship where as the price of oil goes down the pace of freedom goes up in countries like Nigeria, Iran and Russia, and as the price of oil goes up the pace of freedom goes down, and the lines actually cross in all of these graphs. Continue reading Mr. Metaphor and the First Law of Petropolitics. I received an e-mail from Robert Redford forwarded to me this weekend. The text of the message can be read here. Mr. Redford, speaking on behalf of the Natural Resources Defense Council (NRDC), argues that oil exploration should be stopped in this country. Right or wrong, using the political process to inhibit exploration does not address the underlying issue of oil consumption. I enjoy the beauty of Alaska, Montna, Utah and the rest of this great nation as much as anybody. However, these areas have only been opened to our exploration and enjoyment because of industries pouring billions of dollars into airports, roads, utilities and building a local economy. Allowing any special interest to deny economic self-sufficiency to these areas will effectively cut off access to all but the richest adventurers. In Alaska, the oil industry has single handedly built the economy and attracted thousands of workers, residents and visitors who would otherwise have never seen that great state. The National Resources Defense Council (NRDC) uses flawed logic in their argument that fuel efficiency regulation will have the desired effect on our contry's consumption of oil. Andrew Kleit effectively analyzes the actual impact of changes in the fuel economy standards. In the end increasing the fuel economy will only reduce the marginal cost of driving each additional mile. This only encourages more driving. All resources are limited on this earth. The ONLY efficient means of choosing who gets those resources is by awarding access to those who assign the highest value. Jerry Taylor, of the Cato Institute, proposes some solutions to the problem of allocating the resources of the Arctic Refuge. If the FCC can auction off the national resource of bandwidth, why not auction off public land. Certainly Robert Redford could pitch-in to help his environtmentalist organizations to buy a few hundred acres of the Arctic Refuge. It is an honorable effort to preserve beautiful land and protect wildlife. However any effort which ignores the welfare of our human family is short-sighted. But rethinking is what we need, and we need it now. Even the Arab oil states are concerned about their ability to supply the world with enough oil, now that China has stepped into the industrial ring and needs that black gold like everybody else. China can, therefore, do something that it has not had the actual power to do for hundreds of years. It could turn the entire world around and take the lead in settling this oil problem by relying on the profit motive to inspire a completely new direction. How? The Chinese could turn to the automobile industry and say that since it has great pollution problems already, it would greatly prefer an automobile that did not use gasoline. This would get an immediate response. Why? Because China could guarantee sales of at least 500 million automobiles over the next decade. An estimate of 500 million new automobiles over the next decade seems rather high to me, considering the recent slowdown in sales. In one of my speaking classes, the topic of car ownership came up. When I asked how many of the 20 students' families owned cars, two students very shyly raised their hands, clearly fearing they would appear boastful. When I asked who expected their families to have cars by the year 2010, two more students raised their hands. Now admittedly that's a doubling of the number of cars, but still only 20% of the families represented in my class. Anyway, I won't contest his assertion that a no-gas or little-gas requirement will create massive incentives for automobile manufacturers to final alternative power sources--and right quickly. But frankly, I'm dumbfounded that he seriously expects the Chinese to bear the tremendous cost of conversion for the entire world, while we enjoy cheap gasoline. After all, the Chinese already have plans for tougher emissions standards than the U.S. does, and are already investing heavily in fuel cell technology. (I'm not certain how much of this is just a rip-off of other companies' ideas and technology). Continue reading China, Autos, and Oil. This page is an archive of recent entries in the Natural Resources category. Multi-Media is the previous category. Personal is the next category.